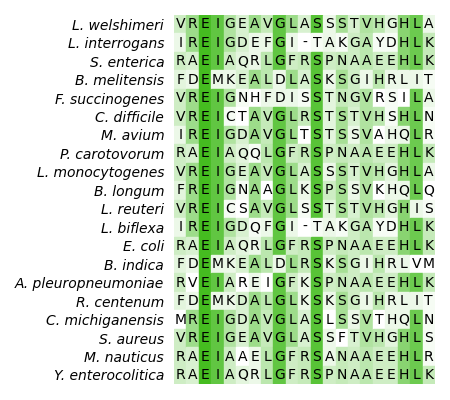 The web page on sequence logos on Wikipedia shows the sequence logo of the LexA-binding motif of Gram-positive bacteria. In this example we look at the other side: What is the amino acid sequence logo of the DNA-binding site of the LexA repressor? We start by searching the NCBI Entrez database for lexA gene entries in the UniProtKB database and downloading them afterwards as GenPept file. In order to ensure that the file contains the desired entries, we check the entires for their definition (title) and source (species). The names of the sources are too long to be properly displayed later on. Therefore, we write a function that creates a proper abbreviation for a species name. Much better. For the alignment (required for sequence logo) we need to extract the slice of the sequence, that belongs to the DNA-binding site. Hence, we simply index the each sequence with the feature for the binding site and remove those sequences, that do not have a record specifying the required feature. But we have still an issue: Some species seem to be overrepresented, as they show up multiple times. The reason for this is that some species, like M. tuberculosis, are represented by multiple strains with (almost) equal LexA sequences. To reduce this bias, we only want each species to occur only a single time. So we use a set to store the source name of sequences we already listed and ignore all further occurences of that source species. Now we can perform a multiple sequence alignment of the binding site sequences. Here we use Clustal Omega to perform this task. Since we have up to 200 sequences we visualize only a small portion of the alignment. Finally we can generate our sequence logo.